Bullies make other children feel afraid and embarrassed. A bully wisely selects her victim and then proceeds to harass or intimidate a weaker child. Girls are more likely to resort to indirect bullying (e.g., excluding someone from a group) and boys are more likely to use direct or physical bullying (e.g., tripping someone). A bully uses power to humiliate and belittle another child. As a result, the bullied child loses confidence and self-esteem and may become depressed or even suicidal. When my children are teased by another child, it affects how they interact with others throughout the day. They certainly lose their beautiful smile and are not as happy. They are quick to disagree and tend to fight with each other – clearly they are out of balance. What if it happened every day? Clearly, I am not a school counselor. Here’s what the professionals recommend that a child do when they are bullied. WALK – If you are being bullied for the first time, walk away without saying anything. 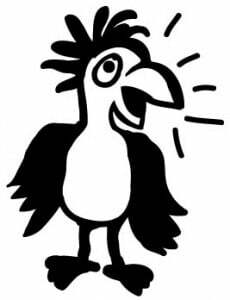 SQUAWK – If the bully approaches you for the third time, tell an adult. As a parent, I strive everyday to guide my children into becoming a respectable and honest person that treats everyone fairly and does not make judgments. I would never tolerate my child treating another child unfairly. If your child is being bullied, I truly hope this information is helpful. For more information, please visit our bullying and teasing page.